"Villa of the Mysteries - the real meaning of these fresco painting scenes will remain a mystery forever." One of the most famous Pompeii ruins that vanished with the Vesuvius volcano erruption is Villa of the Mysteries. There's nothing very different or special about the layout or floor plan of this luxurious suburban villa: built on the slope towards the seaside in the 2nd Ct BC, centered around a perystile and surrounded by terraces, it is just one of the 100 villas (country residences) discovered in the Vesuvius volcano area. 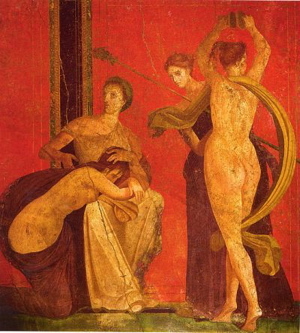 However, the Villa of the Mysteries stands out in all art history study books for one of its rooms decorated with Pompeii fresco paintings, wall paintings that are one of the most important ones in the whole Roman world. What once served as the triclinium, the dining room of the house, is today called The Initiation Chamber. Namely, this room contains a collection of frescoes showing mysterious and strange scenes. The 3 metre high (10 feet) and 15 meters long (55 feet) decorative frieze in the Initiation Chamber is thought to be showing either the scenes of the initiation of a woman into a special cult of Dionysius, a god very popular with both Greek and Roman women, or a young woman undergoing the rites of passage preparing for her marriage. However, it's all just assumptions and the real meaning of these scenes, what exactly is depicted in them and what the purpose of the room was, will remain a mystery forever. It will also remain a mystery who the owner of the villa was. Some historians tend to believe it was Livia, wife of Augustus, the Roman emperor, as her statue was found in the ruins. Just a short walk outside the city walls of the lost city of Pompeii, a visit to this villa and its frescos will be a memorable part of your Mediterranean cruise. If you're wondering how to reach the site of the Villa , here's the directions: to reach the Villa of the Mysteries, you can do so from inside the Pompeii site...just walk north-west until you exit the Pompeii walls through the Herculaneum gate and walk down the Street of Tombs.